It was a perfect June day in the woods. The sky was royal blue, the grass looked soft, and maple trees were everywhere with golden light shining through their leaves. “Aren’t you excited, Clary? !” asked her youngest sister, Eva. “Yeah,” Clary lied, turning away. The car came to a full stop in front of the house, and Eva scrambled over Olivia to get out of the car. Olive, adjusting her glasses, followed suit, and reluctantly Clary slid out after them. The three red-headed girls tumbled out of the car almost at once. Clary took Mack’s leash and led the straining brown Labrador up the front porch. There was, she realized, a window seat. As if that solves all my problems, Clary thought. She and Eva went inside the house together, and Clary took a sharp breath. She liked it more than she would ever admit. Why couldn’t it just be a rental house and not their house? It was, she decided, just a house; not a home. Not her home, anyway. There was something homely about it; worn places in the woodwork where other peoples’ shoes had tread every day, small nicks and chips in the wood and paint, places where the wallpaper had been marked a little. Comfortable things like that. Eva emerged from the bathroom suddenly, grinning and wearing her swimsuit. It was only a short walk from the backyard to the creek. Eva skipped the whole way. There were pretty wild roses with their pink faces uplifted to the tall trees and blazing sky. Clary could hardly admire anything nice at the moment. She looked at her muddy orange sneakers instead. When they got there, Eva jumped right in the creek. 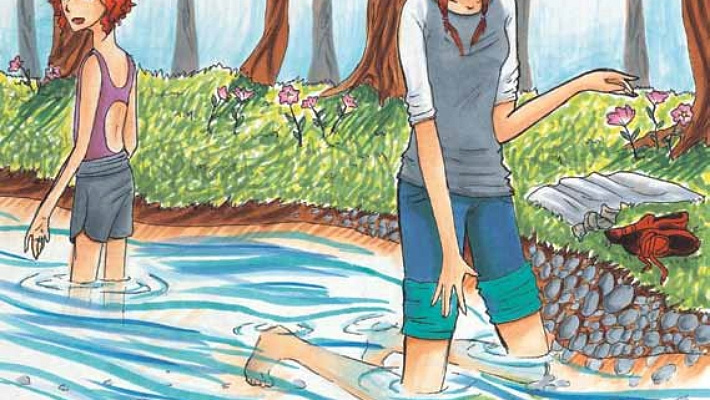 She waded with the water up to her knees, smiling and shivering at the same time. “It’s cold. It’s nice.” It did look nice to Clary, snaking deep into the woods with bright, clear water and smooth, tossed stones at the bottom. She even peeled off her socks and shoes to put in her sweaty feet. It felt good on her toes. 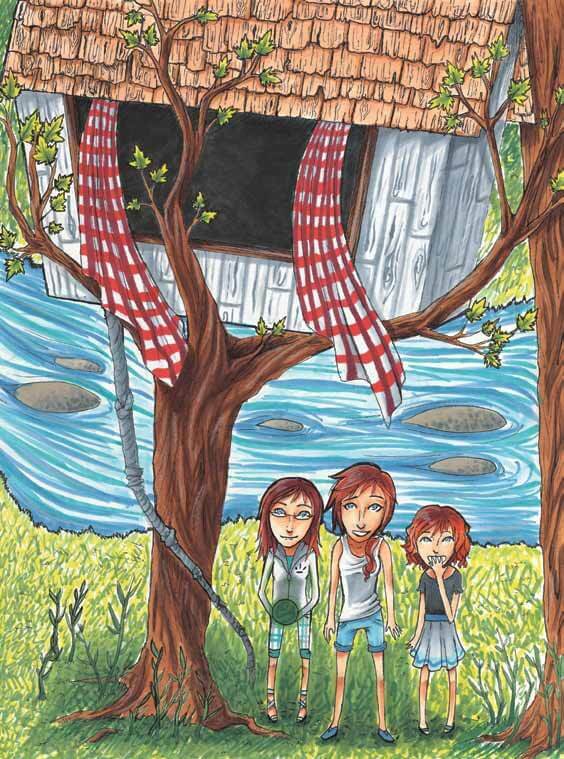 Eva’s short mop of red hair was soon soaked, but she didn’t want to get out of the creek, so Clary let her stay awhile. 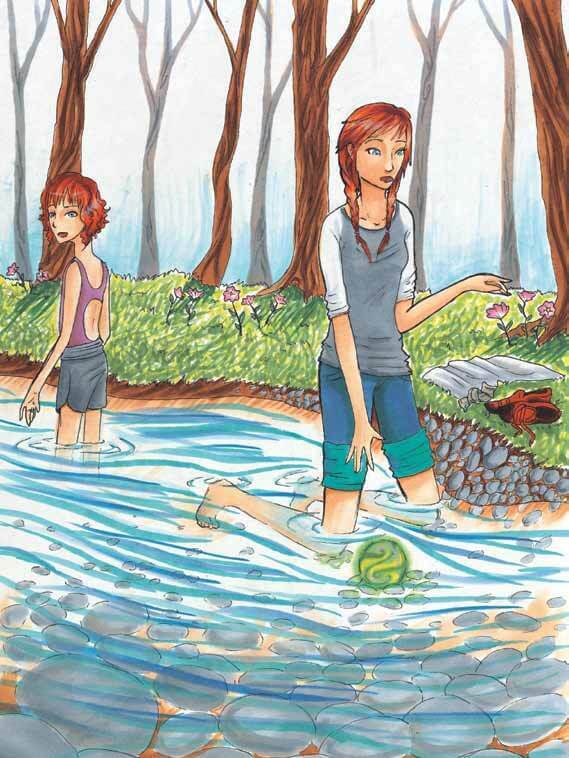 While Eva swam in shallow water, Clary practiced skipping stones for a while and even got a stone to skip four times once. Then it became a way to vent frustration. 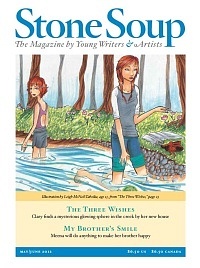 She stood with the water pooled around her ankles and named each rock before throwing it. Splash! The new house. Splash! Ami’s new best friend. Splash! Everything! It hardly seemed adequate revenge. The feeble little splash and ripples from each stone only made her more infuriated. Finally, bending to find rocks just to hurl out of pure temper, she paused. There, lying among the stones, was something else entirely. It was a small sphere, glowing faintly green. Clary’s first thought was that it might be a marble someone had dropped, but that didn’t seem likely. It was bigger than a normal marble, and marbles didn’t glow. She bent to pick it up. She’d expected it to be clammy from being underwater. It was wet, but to her surprise it was very warm, almost hot, tingling her fingertips. She turned the strange thing over in her hand, scrutinizing it. A few seconds passed, and the green glow and the heat began to fade. The sphere sitting in her palm was now dark blue and veined with thin, jagged white. It felt cold now. “What’s that?” Eva demanded, who had noticed Clary’s sudden silence. Eva sloshed up next to Clary to take a closer look. “Can I hold it?” she begged. “No. You’ll…” Break it? Lose it? Clary wasn’t sure, but she felt very protective of the sphere. Eva stared hopefully at her, hands outstretched. “OK,” Clary said, very reluctantly, and dropped it in her little sister’s hands. “There,” Eva said, leaning annoyingly close to it. “It says… t-h-r…” Impatiently, Clary snatched it from Eva’s hands, despite her sister’s protesting. “Three wishes are granted to you,” she read aloud. Her eyes narrowed. “It’s magic!” Eva said breathlessly, blue eyes wide. “Of course it isn’t.” Clary pocketed the sphere. “I want to make a wish!” Eva whined. After that, Eva was so mad she didn’t want to swim anymore, so she wrapped the white towel around her and walked through the woods barefoot after Clary, pouting the whole time. She couldn’t resist talking, saying, “But it can’t hurt to try” and “Please!” Clary didn’t give in. The thing, whatever it was, was hers. They arrived home to a strange sight: Mr. and Mrs. Hunter looking distressed, and Olive’s normally mild blue eyes red around the edges and puffy. She’d been crying. “Mack got loose!” Olive said, her voice tight and sad. She wiped her eyes with her wrist. “He was upset you guys left… and he just ran away!” She stopped talking then, afraid she’d start crying. Clary stood stunned for a moment. “It’s all my fault,” Olive said sadly. Clary led her sisters back inside. “It’s all my fault,” Olive said again. However, their parents returned thirty minutes later with no luck, and after a dinner of macaroni, which might have been cardboard for all Clary tasted of it, it became clear this might be the first night in three years she’d spend without warm Mack curled up at her feet. She would be all alone, in a strange room, in a strange house. She shivered. “Well… OK,” Clary whispered. She was sure it wouldn’t do any good and knew it would make her feel even worse when it didn’t, but she had to try for Mack. For a long second, nothing happened. Then Eva gasped as the sphere glowed green and hot in her hand. They all waited. “Nothing,” Olive said a minute later, crestfallen. “It’s just some trick…” when suddenly, her words were interrupted by a very familiar bark. “Mack!” shrieked Eva joyfully, and all three of them rushed out of the house to greet him. 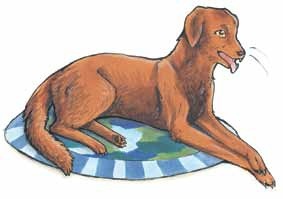 Mack bounded up to them with his tail wagging furiously, and in the ensuing hugs and big, pink licks with his tongue, everyone completely forgot about the sphere, still clutched in Eva’s hand. They almost remembered and then their parents came out to see what was going on, and it happened all over again. Olive had many times thought of what she would wish for, given the chance, but now that she had the opportunity, she just didn’t know what she would ask for. They tried to distract themselves by having fun playing tag in the woods and getting settled in new bedrooms. Finally, Olive announced that she was making her wish. “You’ve already decided?” Clary asked. She didn’t want to be the last to make her wish. It would put pressure on her. Though, she thought secretly, I’m the one who needs a wish most of all—to go home! “So, what did you decide?” Clary prompted impatiently. “I’m just happy having Mack,” Eva said, petting happy, lazy Mack where he was lying next to her. “I’ve always wanted a treehouse,” she admitted. “Hand over the sphere, now, Clary, so Olive can make the wish and we’ll have the treehouse,” urged Eva. They sprinted the whole way, Eva lagging behind (“Wait for me!”) after the other two. They couldn’t wait; they were too excited. They reached the area by the creek, finally, with Eva out of breath. Clary handed the stone to Olive. They waited; then, the sphere glowed green. “It is hot,” Olive said, amazed. When we next looked up there was a perfect treehouse in the tree above, with checked red-and-white curtains rippling in the window. It looked like a playhouse in a tree. Eva fell in love with it at once. “It’s amazing!” she shrieked, and they all fought to get up the rope ladder first. There was even small furniture inside of it. The wood was sturdy enough to keep out cold in winter and to support their weight. There was glass in the windows that opened; Eva could even stick her head out. When they’d all admired every bit of the treehouse, Olive placed the sphere in Clary’s hand. “You know what you want, don’t you?” she asked. Clary bit her lip. She might readily have wished none of it ever happened and they’d never moved. But she thought of the treehouse’s view and all the times playing tag in the woods. She thought of her new bedroom that wasn’t shared with Olive. She thought of Mack coming home. She really did feel content, right now. “I wish,” she told the sphere, “that some other kids will find you too and have three wishes.” The sphere glowed green once again. She dropped it from the window; they all watched it fall into the creek and away. “No. That wish was perfect,” said Olive. They all agreed and sat contentedly by the window to see the view better.